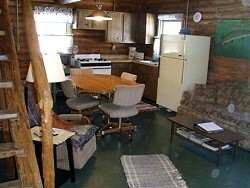 Your Own Log Cabin in the Woods! 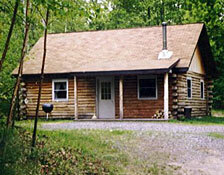 Nestled in the woods, this log cabin is a perfect getaway to peaceful country comfort. A place where the nighttime silence can still be heard and eagles keep watch. A place where time stands still yet races by without anyone knowing where it has gone. A place that refreshes the spirit and clears the mind. 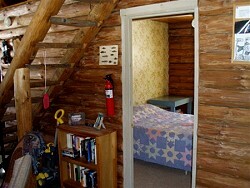 The LOG CABIN was built in 1984 with red pine logs harvested from the nearby forest. It has two downstairs bedrooms, a cathedral ceiling, and a sleeping loft overlooking the kitchen/living room area. 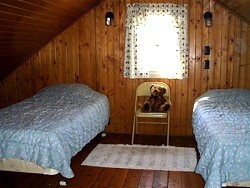 There are two double beds downstairs and two singles in the loft. It sleeps six comfortably. The bathroom has a shower. Linens and towels are provided. The kitchen is equipped with a gas range, microwave, frig, coffee pot, toaster and all the basic utensils, tableware, and pans. It is heated with a wood parlor stove, which has a glass door for watching the fire. There’s an area set aside for campfires, a BBQ grill, and a picnic table. A woodland nature trail takes you to the lakeshore, where there’s a dock for your boat (or we have one that you can rent). 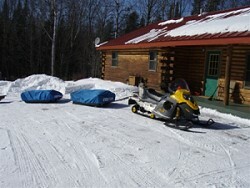 Even though the cabin’s secluded, it’s only 1.5 miles off the main highway to Eagle River for shopping, golf (3 area courses), tennis, horseback riding, go-karting, the movie theatre, all sorts of restaurants, small museums, art galleries, antique shops, and new activities every week. So if you’d like to spend a family vacation alone together or with a few close friends; if you find enjoyment in peace and quiet; or if you’ve been disappointed by overcrowded, noisy resorts in the past, give us a try. Deposit Ploicy – A 50% deposit is required to hold your reservation. This deposit is refundable only if and when the time slot is refilled by another client. 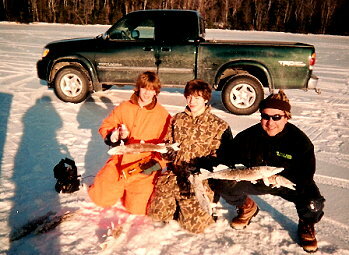 We’re located 13 miles east of Eagle River, WI. Take Hwy 70 thirteen miles east of Eagle River to FR 2196 (Kentuck Lake Road). Go left on 2196 one mile to Tuttle Rd. Take a right on Tuttle and we are the first driveway on the left. Do you like to canoe a lakeshore a sunset? Paddle down a wilderness stream? Fish a pothole lake for water busting bass or drop a dryfly into a shaded eddy? Are you a birdwatcher, an animal watcher, or in need of some quiet time with the latest bestseller? If so, this just may be the place you’ve been looking for. We are surrounded by the Nicolet National Forest, which supports a diverse animal life including fischer, pine marten, and whitetail deer. With the entire forest as your back yard, your family can pick wild raspberries, blackberries, strawberries, or blueberries. The autumn colors are spectacular here in sugar maple country, where maple syrup is produced every spring. And… there are trails for hikers, mountain bikers, hunters, cross-country skiers, snowmobilers, naturalists, etc. etc. ! Bring binoculars – the lake supports populations of bald eagles, loons, and an occasional osprey. Swimming on Kentuck varies from year to year, but there are national forest beaches close by. If you’re attracted to nighttime skies, you may get a glimpse of the Northern Lights, or a meteor shower. Bring a telescope – the unpolluted skies make for excellent viewing. 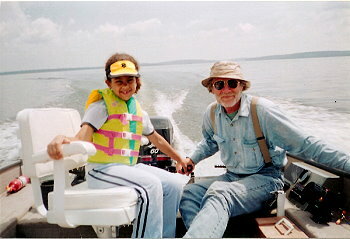 Kentuck has proven to be an excellent lake for children (or the young at heart) to catch a lot of fish. At 957 acres, it’s a relatively big lake. It supports abundant populations of large and smallmouth bass, walleye, perch, bluegill and crappies. 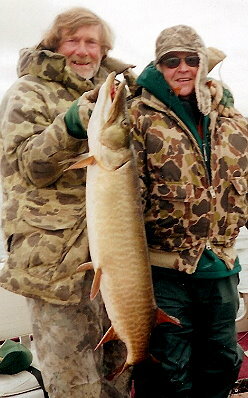 It’s trophy water for musky – a forty inch size limit. 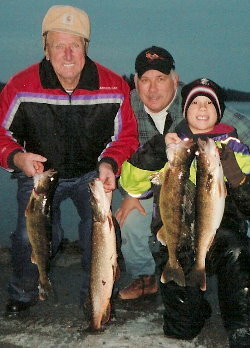 And there’s even a few huge walleyes. 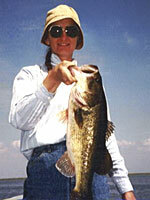 Guide services are available on Kentuck and other area lakes and streams. You can save yourself a lot of time and frustration by spending a day with an expert!